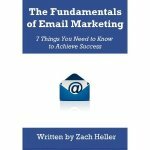 Are there people out there that doubt the value of email marketing? You bet there are. Hopefully they’re not people that you have to work directly with. Hopefully there does not come a time when you have to convince someone that your emails have value. But if you ever should, it’s a good idea to have something to answer them with strongly. It’s the direct subscriber value, and it’s something you can figure out if you put in a bit of time. To keep it simple, you can start with the average number of recipients on just one of your emails. Then you can figure out, assuming you track this, the average number of people who purchase directly off of an email click-through. And if you know the average value of each order, you will end up with the total revenue generated per recipient. But that’s just one email. And we know that people who subscribe to your email list will receive multiple emails from us. Hopefully many multiples, until we stop sending or they unsubscribe. So you can try to come up with an accurate number of emails that each subscriber will receive. This number may get very high. For example, if I send an email per week to one of my lists, then each person will receive 52 emails per year. If I know the unsubscribe rate, which I should, you can lower that 52 number to more accurately show the impact of unsubscribes. Let’s assume for the sake of simple math that no one ever unsubscribes from my emails, my list is 1000 people strong, I send out an email per week, and each email generates $100 in sales.